Since my last startup failed, I have spent a lot of time thinking about the mistakes that I made and how I might learn from them in the future. Many of the mistakes I made were strategic or tactical. Some I could only learn through experience. The harder lessons to learn, though, have been more personal. You are fascinated by ideas…Yours is the kind of mind that is always looking for connections, and so you are intrigued when seemingly disparate phenomena can be linked by an obscure connection. You love all these ideas because they are profound, because they are novel, because they are clarifying, because they are contrary, because they are bizarre…you derive a jolt of energy whenever a new idea occurs to you…ideas are thrilling. And on most days this is enough. I love ideas. I love potential. I love random connections. And I love the dreams they represent, the inherent possibilities of a future not yet realized, just waiting to be grasped. A future untainted by the baggage of choices and mistakes that are the inevitable result of undertaking any endeavor worth doing. That very love for ideas also makes it very hard for me to focus. In fact, I’ve always envied those people who have the ability to put their nose down and just grind sh*t out. It’s an amazing talent, in my opinion. It’s just not my talent. And, I think it’s a big part of the reason my last company failed. It took me a long time to admit that, because it was deeply personal. It required me to recognize that it wasn’t merely external circumstances that caused things to go wrong. I needed to change. I needed to be better. I lacked the discipline and focus needed to execute. And, for a young company, execution, fast execution, flexible execution, informed execution, iterative execution…is everything. Unlike large companies, small companies don’t have loads of resources to burn. You have to work hard and be clever. Because that’s your competitive advantage. Speed. Cleverness. And execution. So, when my current company started growing, I resolved not to make the same mistakes I had already made. I was quicker to invest in opportunities that could lead to growth. And I was quicker to invest in opportunities that mitigate the risk I pose to myself and my team. I frequently harp on traditional business plans like the kind I learned about in business school. I still think they’re stupid. I still think the amount of time and energy spent on them is generally a waste of time. I firmly believe the business model canvas is a much better tool for a startup (and for any organization trying to innovate, IMO). That said, the act of planning is important. Without plans, our dreams are just that…dreams. But planning has to be a deliberate exercise, rooted not just in research gleaned from the internet (competitive analysis, anyone?! ), but rather rooted in our entrepreneurial drive, ambition, ability, and desire to drive outcomes. In other words, our plans should serve as focused tools to move things forward, not laborious exercises to make us feel like we’re making progress, when really what we’re doing is trying to convince ourselves (and those around us) that we’re clever. So, if business plans are stupid, but planning matters, then how should we plan? Verne Harnish, in his book, Scaling Up, claims that there are four things that growing companies must master if they are going to grow: people, strategy, execution, and cash. To help founders, entrepreneurs, and CEOs scale these things properly, as well as make sure they – and their teams – are moving in the right direction, Verne provides a powerful tool: the One Page Strategic Plan. For him, “a vision is a dream with a plan” and the One Page Strategic Plan is the plan that helps to accomplish the vision. The One Page Strategic Plan is an internal document that acts as a beacon for all in the company. It lets everyone know where they’re going, what metrics matter, and who is accountable for making sure the company’s goals are achieved. Rooted in sound business best practices from top-notch business brains such as Jim Collins and McKinsey, and tested by thousands of companies using their methods, it’s pretty awesome. Unless you’re one of those companies that’s still just a little too small. In other words, you’re growing enough to need some systems, but are not yet so big that you need all the systems and exercises he describes. In my case, I found that there were quite a few chunks I didn’t need right now. I assume that many people in my stage are similar; you know you need to execute, you have a small team that needs to be on the same playbook, and you want to make sure that your efforts are focused on the things that matter most, so you can get to the next stage of your business (whatever that might be). So I developed plan with the components that were most relevant to me. 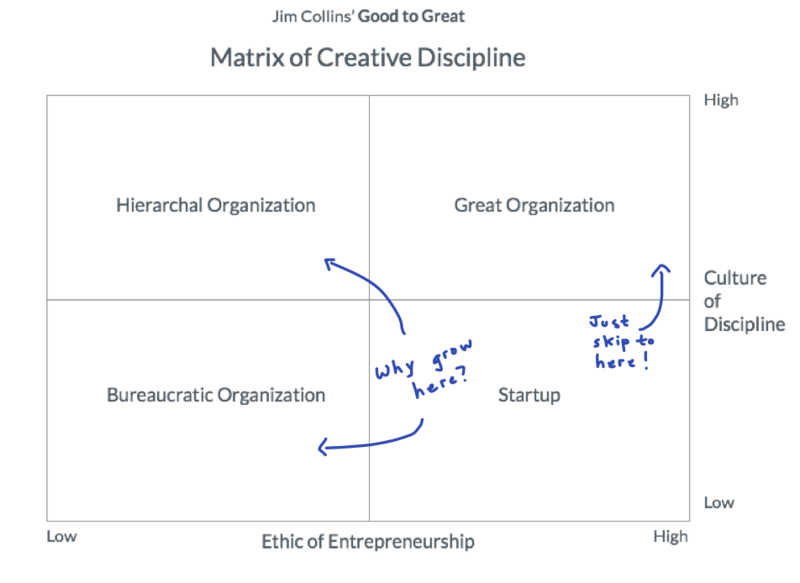 Jim Collins is one of the most significant management minds around today. One of his most famous books, Good to Great, explores what distinguishes great companies from good companies (as determined by a variety of measures, including long-term fiscal performance). Using a robust research method, they devised a handful of principles that winning companies possess. Irresponsibly dumbed down, these themes consist of: Disciplined People, Disciplined Thought, and Disciplined Action. So, what did it mean to be disciplined? It meant, among other things, that they had the right people working on the right things, in the right system. And they didn’t do things that didn’t matter. They were focused. As companies grow, there’s a tendency to lose focus, to lose discipline. Those organizations run the risk of becoming the bureaucracies or hierarchies we all hate. Great companies, though, never lose their entrepreneurial spirit. If anything, they enhance it. They augment it. They build on it. How Can I Iterate and Be Focused? Because startups are in search of a business model, they are constantly iterating. As a result, it seems like they don’t have the luxury of focus. I disagree. At that point, your focus is on validating your business model. All of your resources should be dedicated to that. Even myself, with a young company, is still in the process of trying to validate my business model. So, that becomes my focus. And validation happens through a disciplined, structured process of hypothesize, experiment, evaluate, repeat. The strategic planning process I’ve devised for myself recognizes that validation is the focus. So, I take for granted that one of the core priorities in the plan is validating the riskiest element of your business model. It will vary for each business. As the startup finds its legs, the plan becomes clearer and, over time, begins to require all the elements of Verne’s plan in Scaling Up. For me, I’m expecting that rounding Q4 2015 into Q1 2016, we’ll need to use a slightly different plan that more closely resembles Verne’s. The process I devised (and used for both StartupLansing and Cognite Labs) has only five simple parts. It’s stupidly simple. And that’s by design. Because it’s intended to live in the space between a draft and a document. And it needs to be simple enough that everyone on your team (and possibly some outside partners) can look at it quickly and know what you’re up to. Ok, I’ll pause for a second while you roll your eyes. It’s forgiven. Because that was my reaction, too, the first time I read Mastering the Rockefeller Habits. “Give the meaty stuff, Verne, not this wishy washy BS,” I remember thinking. But it’s important. Especially if you haven’t yet found product-market fit, it’s essential to know why you’re doing what you’re doing. And, when you bring people on (especially hard for a startup, because there’s so much less certainty you’ll be able to pay them for any consistent period of time), they need to know why you exist. For startups, this is akin to writing a really compelling value proposition. For many startups, it’s also important to recognize that this is a hypothesis…until it’s not. Despite that, knowing why is generally more important than knowing what (Still doubt me? Check out Daniel Pink’s Drive, then let’s talk). Again, seems wishy-washy, but is really important. Especially as you start to grow, knowing what you stand for, what kind of a culture you want to have helps with screening employees and vendors. And helps you to evaluate your current team. Don’t overdo it here. Chances are, there aren’t more than 3-4 core principles that are truly essential. As a startup entrepreneur, you likely have one. Many of us do. But, as a resource strapped company just trying to survive, it almost seems too wishful for me. So, I devised a single “Big Goal” that describes the state of the world as I’d like to see it in just one year. For me, this is the “if-nothing-else-gets-done-but-this-it’ll-be-a-great-year” kind of goal. For a startup that hasn’t yet found product/market fit, one of these priorities has to be validating the riskiest part of your business model. Because you can’t build a business without a business model. Beyond that, there may be one or two other priorities you have or need to help you advance your Big Goal. More than three and I think you’re spreading yourself too thinly. In addition, when I crafted my quarterly priorities, I did so with the expectation that this element of my plan will be revisited quarterly and only outlined my priorities for Q1 and Q2. I expect they’ll change slightly from Q1 to Q2 and they’ll change dramatically from Q2 – Q4. What key metrics do we need to watch? What routines or habits do we need to have? Who is accountable for the success or failure of this tactic? Tactics are vital efforts whose collective success increases the likelihood your quarterly priorities will be accomplished. For a startup, this might be “Implement a Sales Process,” “Grow our Audience,” or the like. Whatever they are, they need to be efforts that are tied to the quarterly priorities. I like data. Unless it’s the data my smart body analyzer is giving me the day after Christmas (#fail). But, even that data is useful because it provides me information about the success (or, in this case, massive failure) of an effort that matters to me: my fitness. As a business owner, you need to learn to love data. Relevant data. Not weird-statistics-nobody-really-needs-to-know kind of data (though, I do think that kind of data is interesting too!). More importantly, you need to know what data you need to track to know if your tactics are working. If you don’t track the data, you won’t know how to improve, which efforts to stop funding, or when to pivot. For each tactic, identify a handful of key metrics (no more than 3 or 4 per tactic) that you can use to benchmark and track your efforts. Then, as you review the data each week, month, or quarter, you’ll know which efforts are working and which ones aren’t. For real. One of these days, I’ll write a whole post on the importance of routine and habit. Not today. Suffice it to say, though, tactics don’t accomplish themselves. They require work. And, more often than not, they require consistent, routine, focused work moreso than isolated, grandiose gestures. In my plans, I identify routines and habits that need to be done daily, weekly, and monthly. The sum of these efforts should move my key metrics in the direction I expect. If the metrics aren’t moving, then either a) the effort is failing, b) we’re failing at executing properly, or c) I picked the wrong thing to measure (part of the reason I advocate a few KPIs is because it helps with providing more context than a single number does). Whatever the outcome, the routine gives me a solid basis for evaluation. Equally importantly, having clear expectations about the routines, habits, and work to be done makes it easier to coordinate the effort of the people I’m working with (and myself!). Assigning owners to each of the tactics is the final component of the tactics section of the plan. Assigning owners provides a clear line of accountability for who is responsible for making sure that tactic succeeds. Or, if it appears doomed, being able to demonstrate why its doom was inevitable. We’ve all heard the adage, “if everyone’s accountable, then nobody’s accountable,” right? It’s true. Whether the tactic’s success is depending upon a colleague, an employee, or a vendor, there needs to be clear accountability. Otherwise, the job won’t get done. What’s not in the plan matters just as much as what is in the plan. Maybe, even more. Because what is not in the plan doesn’t get done. Period. Finally, the plan is intended to provide discipline and structure, without being so rigid as to preclude flexibility. In practice, this means that the plan should be revisited quarterly, assumptions and priorities updated, and tactics repurposed, as necessary. In the interim, you should have a consistent rhythm of check-ins (at the very least, weekly), to make sure things are on track. That said, I caution against any tactical or strategic changes within a given quarter. You might update your approach to a tactic (e.g., how frequently you blog), but most decent tactics take at least a few weeks, if not a few months to get traction. Patience is an important part of focus. It’s the beginning of a new year. I have high ambitions for this year, as I hope do you. As you reflect on where you want to take your company, I encourage you to check out Verne’s book, Scaling Up. It’s a great resource. But, if you think you’re still too early for that, then try out the approach I’m suggesting. Whatever approach you take, I wish you the best of luck in 2015! Jesse is the founder of StartupLansing. He enjoys technology & entrepreneurship and believes that Lansing has many of the resources needed to break out as a city. When he's not working on StartupLansing, he's running his software company, SuperWebPros, or hanging out with his family. You can find him on Twitter (@jflores1c) or LinkedIn(jafloresjr).